April 25, 26 & 27 at the Toronto Sheraton Hotel on Queen Street West. I’ll be there from 7:00 am until about 4:00 pm with lots of gorgeous jewellery, some made by me and some made by Native American artists from the US southwest. Anyone is welcome to drop in and shop in the marketplace even if you’re not registered for the conference! 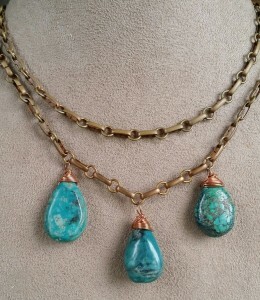 The necklace below is one of my pieces – turquoise drops on vintage brass chain.